Saeed Abedini has been imprisoned in Iran for 18 months, unable to see his wife or children, and with no end in sight. Our government has ignored multiple opportunities to fight for his freedom. 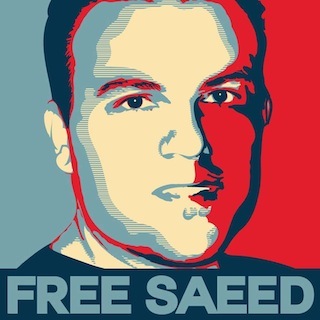 Tell other people about Saeed and link to the petition. Share his story. If it was your spouse . . . would you? I know what you are thinking. That third request is pretty extreme. After all, I’m talking about your profile picture. I know you like to reserve it for pictures of your kids, or your favorite football team, or your latest selfie, or a giraffe because you got some riddle wrong. But maybe, just maybe, you could use it to advocate for the life of a man who hasn’t seen his kids in 18 months. If it was YOUR spouse, would you? Reblogged this on Tales of a Twin Mombie. What a mission…Prayers and hope go out to Saeed. I hope our government is doing everything they can to assist his safe and speedy return. His faith Lord, let it be enough to move these mountains. Hear his faithful plea. signed the petition and facebook shared… prayers and God bless.